Pago Pago, American Samoa to London, England. 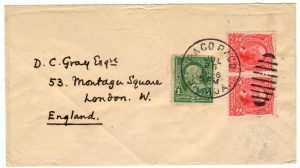 A lovely small envelope franked with a 1st Bureau 1-cent stamp and a pair of 2nd Bureau 2-cents Washington Flag stamps to make up the UPU letter rate for a 1/2 ounce. Sent from the U.S. 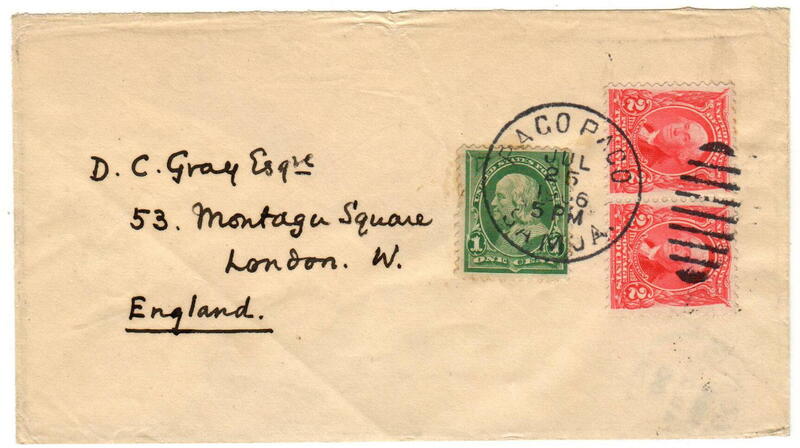 Possession, American Samoa in 1906 to London, England. By 1906 newer versions of the 1¢ and 2¢ stamps had been issued, the 2nd Bureau 1¢ and 2¢ shield stamps were available in 1903 in the States’ as well as American Samoa.